1. Feeling Command: A tennis instruction that hints at the feeling required to hit a shot. It is using spoken language to try and approximate the feeling you would experience while hitting a tennis ball in a certain way. This is as opposed to a Logical Command. 2. Logical Command: A command that comes from observation of the outer stroke by the tennis instructor. The instructor sees a mistake and addresses it directly to the student. The only problem is that the students subconscious does not work like that. It works with feelings and pictures. It thinks from the whole and does not understand logic directly. It works through feeling and images. So a logical command is one that is not understood by the student's subconscious mind. 3. Inner Language: The language of the subconscious. It has nothing to do with words. This language can process millions of pieces of information at once. To learn tennis or any sport correctly you must learn to communicate with your subconscious mind. The Inner Language seems to be communicated via light and feelings. It's an inner sense of knowing without the use of words. It can be later translated to English. 4. Inner Mechanics: The process by which the subconscious supplies you with the information to hit any shot. 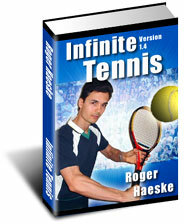 It is working at all times giving you the instruction you need via the inner language to hit any shot in tennis. 5. Thinking From The End (TFTE): Visualizing yourself having achieved your goal as opposed to thinking of your goal. When applied to groundstrokes it goes something like this: when you think of how to hit your mechanics you will tend to struggle and make lots of mistakes on your groundstrokes. When you don't think how, but instead just think of your desired result your strokes become fluid and you achieve your goal quickly. Don't see yourself as where you are, instead see yourself from where you want to be. This technique will super accelerate your learning process. 6. Whole versus Parts Thinking: When you are playing from a Natural State you think from the whole. When you analyze and use logic you are thinking in parts. You have to choose the correct time to use Parts Thinking and Whole Thinking. During a match you will mostly want to think from the whole or use Feeling Commands. During practice it is often appropriate to think from the part to get a better understanding of mechanics. 7. Stroke Template: The basic understanding of a groundstroke that is necessary to be able to hit that shot under all sorts of conditions. Once you learn the Stroke Template for topspin for instance, you can hit topspin at all different heights, ball speeds and even behind your body if necessary. The key is that you don't have to practice every single stroking situation, by knowing the Stroke Template and then listening to your Inner Mechanics you will then know how to hit the shot or whether it is even possible to hit under the circumstances. 8. Unlimited Potential: Your potential as a tennis player or anything else in life that you choose to pursue. 9. Belief Map: The totality of all your beliefs. Your beliefs, conscious and subconscious determine how good you can ever become as a tennis player. Want to be an advanced player then you must first believe that it is possible. For if you don't, you'll never get there no matter how hard you try. 10. Self-Reliant: Is how every tennis student should be. To be a great player you must become your own tennis instructor. You must learn how to coach and correct yourself during a match. You must also become a very active learner. To learn you must constantly experiment until you get the results you've been looking for. Don't become over reliant on what a tennis instructor tells you. The instructor can only give you parts of the picture, you must fill in most of the pieces. This can't be done if you are not willing to experiment and try new things. 11. Magnification: What you focus upon magnifies. If you focus on your mistakes you will believe that you are making mistakes all the time. A learning study was done on optimists and pessimists. The pessimists were more accurate in their assessments of their test results. The optimists thought they did better than they actually did. But over time the optimists tested at higher level than the pessimists. If you focus on the negative that is what you will get. Focus on the positive then that will be magnified in your awareness and you will succeed. Always focus on what you want and not on what you don't want. This goes along with the TFTE theory described above. 12. Student's Perspective: This is the student's point of view in the learning process. The Student's Perspective is very different than the Instructor's Perspective. It's the point of view of seeing and observing (Instructor's Perspective) versus the point of view of doing (Student's Perspective). This is a very important distinction because in order for the student to learn quickly and without frustration the suggestions given to him should be in tune with his perspective. The two perspective points of view are often at odds with each other because the Instructor's Perspective does not translate to the student's Inner Language.